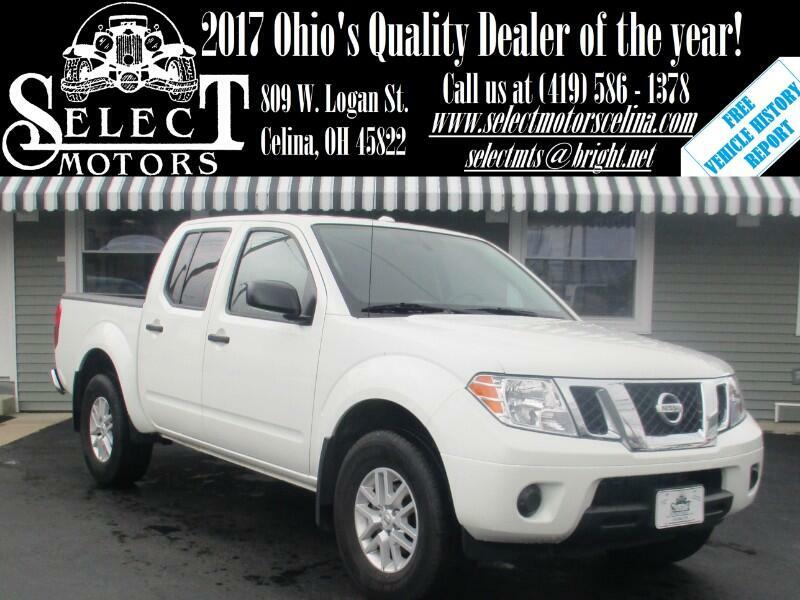 ***TXT US @: (419) 362 - 6200*** 4WD, 4.0L V6, Crew Cab, Backup camera, towing pkg, Bluetooth, SiriusXM, A/C, power windows/locks/mirrors, keyless entry, AM/FM, auxiliary and USB port, steering wheel mounted audio controls, tilt and telescopic steering wheel, cruise control, information center, 16" alloy wheels. Fuel Economy: 15 city / 21 hwy. Warranties: Balance of Nissan's 3 year or 36,000 mile bumper to bumper and 5 year or 60,000 mile powertrain. In service date: 11/28/2017. Extended service contracts available. The 2018 Nissan Frontier is a midsize truck offered in two body styles (the King extended cab or four-door crew cab) and with 5-foot and 6.1-foot bed lengths. Two engines are available, a 2.5-liter four-cylinder (152 horsepower, 171 pound-feet of torque) or a 4.0-liter six-cylinder (261-hp, 281 lb-ft). Both can pair to either a six-speed manual or a five-speed automatic transmission (the four-cylinder is also available with a five-speed manual). There are five trim levels: S is the base model; the SV, with an upgraded interior; the Desert Runner, which pairs off-road-oriented features with two-wheel drive; the four-wheel-drive-only Pro-4X; and the top-tier SL, which is the best optioned overall. The base S trim starts with two-wheel drive, an extended cab, a 2.5-liter four-cylinder engine and a five-speed manual transmission. Standard features include 15-inch steel wheels, rear privacy glass, cloth front bucket seats, air-conditioning, cruise control, Bluetooth, a rearview camera, a 5-inch central display, steering wheel audio controls, Siri Eyes Free voice command, and a four-speaker sound system with a CD player, USB input and an auxiliary audio jack. An optional Work Truck package adds a spray-in bedliner, bed rail caps, splash guards and rubber floor mats. The SV builds on the above features with 16-inch alloy wheels, power accessories (windows, door locks), sliding rear window, and satellite radio. Options include a sunroof on the crew cab and a Value Truck package that adds foglights, rear parking sensors, a rearview camera, a sliding bed extender, a spray-in bedliner, adjustable cargo tie-downs, a Class IV trailer hitch, dual-zone automatic climate control, heated front seats, an auto-dimming rearview mirror, and two extra speakers on extended cabs. The SV crew cab is also available with the Midnight Edition package, which adds blacked-out 18-inch wheels, side steps, body-colored bumpers, and side mirror housings.